No, this isn’t a tale about a bold and fearsome gentleman from the land of my ancestors. Quite the contrary, it is simply my way of paying a small tribute to a gentle and beautiful species of plant which is endemic to the Atlantic isle of Tenerife, my family’s home for four generations. Visitors to the landscapes of Las Cañadas and to Mount Teide are always stunned by the natural park's spectacular volcanic landscapes, by the sharp black lava sparkling in the sunlight and by the pumice stone dunes once mined by an Anglo-French company. 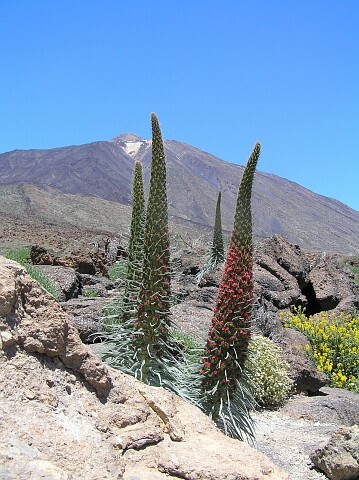 If lucky enough to be in Tenerife in the late spring and early summer they will also be marvelled by the splendid sight of Echium Wildpretii, regiments of towering plants with narrow silver-grey leaves and blossoming with hundreds of dark pink and almost red flowers right up to their spiked tips. Until I read an article in The Scotsman in June 2000, I proudly thought this amazing plant, locally known as the Tajinaste del Teide or the Red Tajinaste, could only be found in the high, arid and volcanic landscapes of Tenerife and La Palma. However, The Scotsman reported that a five feet tall Echium Wildpretii was flourishing at Inveresk Lodge Gardens in Musselburgh, just south of Edinburgh and close to Loretto School, once famed for its rugby and spartan discipline. In fact this particular plant was grown from seed at Tresco Abbey on the Scilly Isles, where the climate allows a variety of plants to flourish. Now I understand that this “Tower of Jewels” as it has become known by horticulturists, can be found not only in the Scotland but throughout the world, if planted in well drained, not very rich soils, and that its cousins, the blue echium candicans and echium fastuosum, also known as The Pride of Madeira, do well in New Zealand. Nevertheless, the Tower of Jewels was given the specific “Widpretii” epithet in honour of Hermann Joseph Wildpret, a German born scientist of Swiss parents who became principal gardener at the famous Botanical Gardens in the Orotava Valley in Tenerife in 1860. 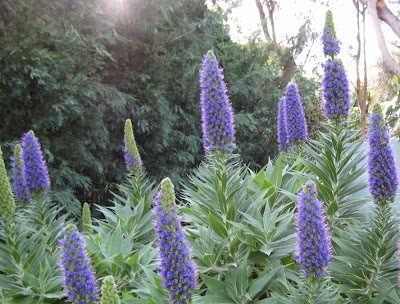 He is believed to have sent Kew Gardens its first example of Echium, a name which stems from the Greek word echis, meaning “viper”, perhaps due to what some researchers suggest was an ancient belief that the echium vulgare could be used as an antidote if bitten by an adder.